 CFI Michigan hosted their annual Solstice Dinners in Grand Rapids and Madison Heights (in the Detroit Area) on December 13 and 16 respectively, with 120 combined attendees, despite the terrible snow storm. Eddie Tabash, CFI’s Board Chair, was the special guest at both dinners, and spoke about the dangers our movement and our country are currently facing and how supporting CFI is crucial to confronting those challenges. He also facilitated the “passing of the torch,” as mentioned in the above news item, honoring Jeff Seaverfor twenty years of dedicated work building CFI Michigan. Eddie also expressed his confidence, and that of the national CFI leadership, in Jennifer Beahan as she takes on her new role as executive director. 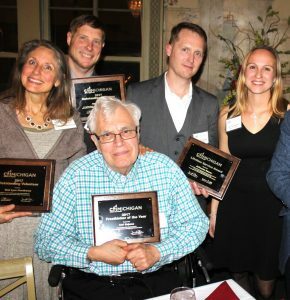 The Advisory Board honored Jeff with a Lifetime Achievement Award, and the Freethinker of the Year Award was presented to longtime member and supporter of CFI Michigan, Carl Bajema. Carl was a professor of biology at Grand Valley State University (GVSU) for more than forty years, with visiting professorships and fellowships at several institutions including Harvard. He has been a member of the branch since the early days of the Freethought Association, was responsible for first bringing Richard Dawkins to Michigan to speak at GVSU in 1997, and was a vocal supporter of evolution when other biology professors at GVSU were advancing creationism. He was responsible for authoring the Michigan Science Standards for teaching evolution.